In the closing months of the Second World War Frank Gillard found himself at the centre of history in the making when General Montgomery insisted that he be present in his tent to witness the unconditional surrender of the German armies in Europe. 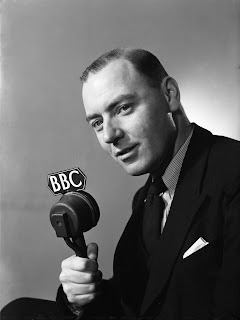 As one of the BBC's war correspondents Gillard would broadcast on the nightly War Report mapping the progress of the liberating Allied Armies in north-west Europe. After the hostilities had ended he enjoyed a long career both on-air and behind the scenes at the Corporation where he oversaw events that would help reshape the broadcasting landscape of the post-war radio service. He espoused the principles of public participation in broadcasting and respected regional loyalties, a combination of views that led him to champion the cause of local radio. Born in Devon in 1908 and educated in Somerset and Exeter Frank Gillard drifted into sound broadcasting quite by chance. He'd become a school master in his native Devon but by the late 1930s was making occasional broadcasts in the West Region. In 1941 he was asked to join the BBC full time though he was initially reluctant to do so until he was told that the government could direct people to join the BBC as part of the war effort. He was appointed as a Talks Assistant and then a War Correspondent (Southern Command) based in Bristol. Gillard had an eventful war witnessing the raid on Dieppe, following the Eighth Army as they moved northwards across the Mediterranean where he built up a friendship with General Bernard Montgomery, at one point even having to procure a puppy for Monty, which he named Hitler! Frank tried on several occasions to reclaim the £25 cost of buying the dog on his BBC expenses and only finally succeeded when he told the accountant that it was a payment in lieu of all the broadcasts that Monty had made on the BBC for which he'd not been paid. He was on the front line with the Fifth Army for the invasion of Italy and spent six months covering the Italian campaign. In 1944 Gillard covered the Normandy landings and the momentous entry into Berlin. In May 1945 he covered the signing of the German surrender. It had been in May 1943 that the BBC's front-line unit, of which Gillard was a member, was christened the War Reporting Unit and later that year took part in the full-scale invasion practice, Operation Pirate, and special training courses held at Wood Norton in March 1944. Before D-Day plans were already in motion to implement War Report with BBC engineers perfecting the new midget-recorder weighing 40 pounds and carrying twelve double-sided discs. War Report was broadcast nightly between 6 June 1944 and 5 May 1945 and provided a rapt audience with first-hand accounts of events during the final year of the war. The team also included Chester Wilmott, Howard Marshall, Stanley Maxted, Guy Byram, Wynford Vaughan-Thomas and Richard Dimbleby. The broadcasts still make fascinating listening and in 1985 Frank Gillard revisited France and recalled the War Report programmes in two documentaries broadcast on BBC Radio 4. After the war Frank Gillard returned to Bristol where he would soon become the Head of Programmes for the West Region. One of the first issues facing him was the threat of a merger of the West and Midland regions, a recommendation in the 1946 White Paper on Broadcasting Policy and tied into a post-war shortage of wavelengths. The then West region director Gerald Beadle and his staff set about mobilising public and political support. Eventually after a brief but vociferous outcry a compromise was reached involving the re-use of an ex-German wavelength by the BBC's German Service. Beadle, backed by Gillard, congratulated West of England people in the way they had "served their own broadcasting service"
At Bristol Gillard would oversee one of the BBC's most popular and long-running programmes, Any Questions? Gillard's policy was to "get away from the artificial atmosphere of the studio as much as possible and take the microphone among the people." He first set out to achieve this with the touring programme Speak Your Mind in which chairman Gordon McMurtrie put a number of questions (sent in by listeners) to a representative audience in whatever town it was visiting. Audience members were encouraged to express their views openly and spontaneously at the microphone. 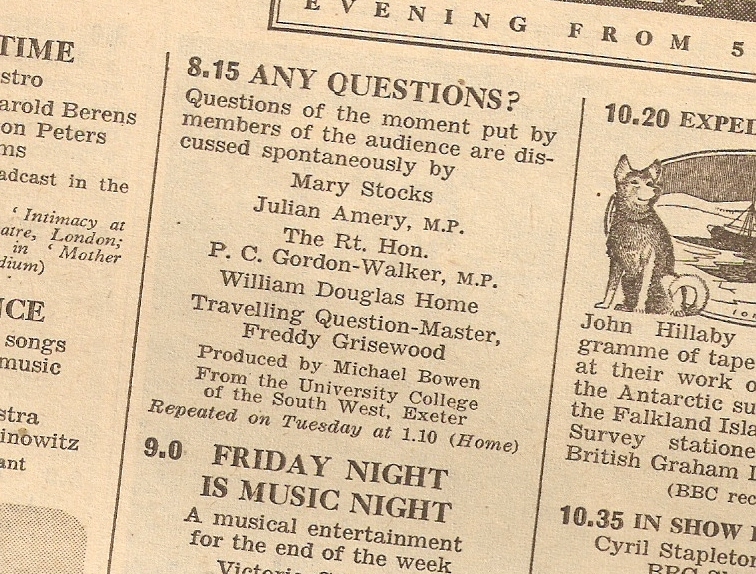 Any Questions?, first heard in the West Region on 12 October 1948 - the panel included John Arlott- was seen as complementary to Speak Your Mind and was a kind of Brains Trust, except one that broke free of the studio and toured the vast West Region, stretching as it did from Land's End to Brighton. 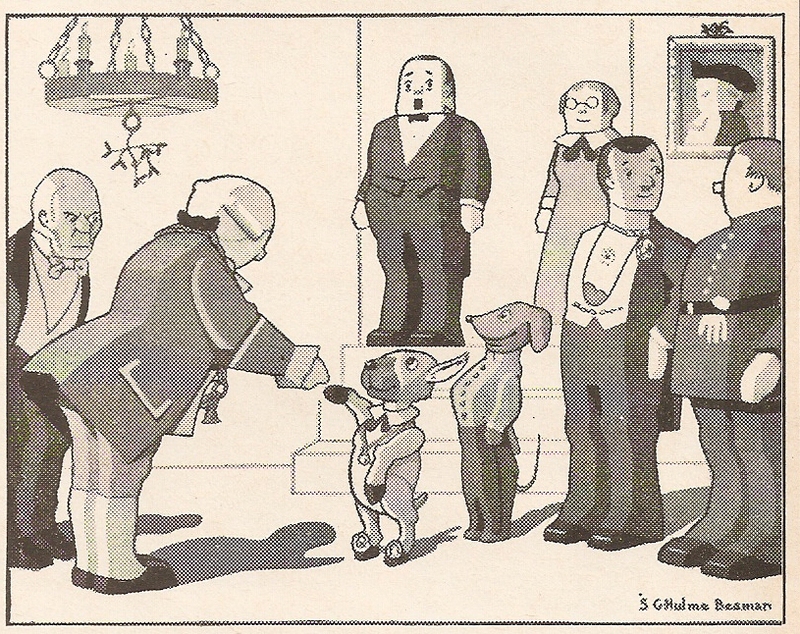 The programme was eventually heard nationwide from June 1950 when it was carried across the whole of the Home Service, though it remained rooted in the west for its venues for the best part of two decades. It gained an even bigger audience of sixteen million from September 1950 when it was moved to the Light Programme with a Home Service repeat. Frank continued to oversee the programme, which was initially produced by Nicholas Crocker and then Michael Bowen, for the first seven or eight years, helping to select panellists and venues and even sitting on the main stage during the broadcasts. When he was appointed to a management post in London he was not averse to popping down to Bristol to sort out any problems such as the time in December 1955 when there was some criticism on the programme about what the Archbishop of Canterbury had or hadn't said about Communism and the use of the H-bomb. Whilst heading up the West Region Gillard was still heard on air. He introduced Country Mixture billed as "the a programme of facts and fancies, legends, stories, and songs from the Counties of the West." He also covered major state occasions such as the 1947 Royal Tour of South Africa, the wedding of Princess Elizabeth and Prince Philip later that year, the Commonwealth tour of 1952 which ended abruptly with the news of the death of King George V and the Coronation in 1953. In July 1955 Frank moved to London as Chief Assistant to the Director of Sound Broadcasting. Already he was considering what was beyond the horizon. In 1954 he'd been able to tour the United States and Canada to look at their radio operations and what he saw - detailed in his management report Radio in the USA: A Visitor's View - spurred his interest in promoting local radio. In February 1955 he wrote a report on The Extension of Regional Broadcasting that recognised that the coming of VHF transmissions would make it technically possible for the BBC to have as many channels as it required. Meanwhile, following his appointment as Chief Assistant he was asked to chair the new Sound Co-ordinating Committee to look at the future of the existing radio services as well as considering any response to the large audiences that Radio Luxembourg enjoyed. Gillard was also part of a BBC delegation that travelled to Moscow to look at the Russian radio and TV operation. Discussions on future co-operation foundering when the subject of Soviet jamming of BBC programmes came up but they did secure the names of two Russian broadcasters who spoke excellent English and would take part in radio hook-up discussions of current affairs. In 1956 Frank Gillard was back in Bristol as Controller, West Region when Gerald Beadle was promoted to become Director of Television in London. 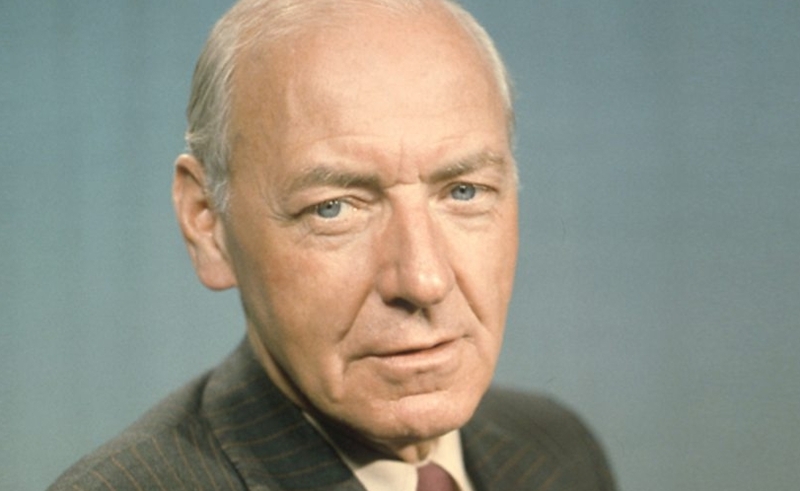 He took an executive role in the closed circuit local radio trials in 1961 and 1962 and was key in persuading the Pilkington Committee on Broadcasting of the value of local radio. By 1963 he was back in London as Director of Sound Broadcasting. The 1960s saw a massive increase in the influence of television at the expense of radio audiences and Gillard was instrumental in steering through many of the changes that sound broadcasting needed to make. The BBC's Features Department had been responsible for some remarkable radio productions since its formation in July 1945. It had been the home of creative types such as Dylan Thomas, Louis MacNeice, D.G. Bridson, Charles Parker and Douglas Cleverdon producing pure radio art forms such as the award-winning radio ballads. However by 1964 it was thought that the department had lost its way and was proving expensive to run. "The reasons for closing the department", said Gillard, "lay in the direction of good organization and the achievement of high professional standards." He thought them "amateurish" and undisciplined" and as "taking the BBC for a ride". The Features Department was closed in March 1965. Causing even more of a ruckus was the ending of Children's Hour in 1964. In fact the die had already been cast in April 1961 when the title Children's Hour was dropped in favour of Junior Time, and later as For the Young. The reason? Kids would rather watch Blue Peter on BBC TV or ITV's Five O'Clock Club. Children's Hour listening figures had dropped to a mere 25,000, and many of those were adults. Gillard's, albeit reluctant, decision to finally pull the plug in 1964 lead to a furore in the press, Slamming the Door on Wonderland headlined the Daily Herald for an article by Dennis Potter. 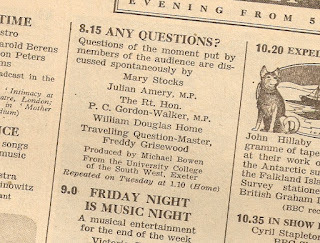 And there were questions in Parliament: "Is the Postmaster-General aware that considerable public dismay has been expressed about the BBC's decision to discontinue the broadcasting of Children's Hour?" During Gillard's tenure BBC radio was able to extend the hours for the Light Programme - something it had to get permission to do by going cap in hand to the government - and introducing the Music Programme, a daytime service of classical music using the Third Programme's unused wavelengths. But of course the biggest change facing BBC radio was one that was foist upon it. It's possible that the corporation may have chosen to operate a popular music service even if the offshore pirates hadn't come along but a full head of political steam set the pace and by 1967 Gillard was publicising the introduction of Radio 1 and the re-numbering of the existing Light, Third and Home as Radios 2 to 4; something that was his idea by all accounts. (see Radio 1 at 50 - The New Popular Music Service). Around the same time as the national changes Gillard was putting the final touches to the new BBC local radio stations that would launch that year. Whilst he'd managed to sway the Pilkington Committee to see the benefits of local services it would take a few more years of behind the scenes persuasion and negotiation, led by Gillard, to obtain agreement in a 1966 White Paper for an experimental roll-out and to get local authorities onboard to secure funding. (see The People's Radio). Gillard retired from the BBC in 1969, having successfully seen the local radio experiment get the go-ahead to expand, though he continued to work for the Beeb for the rest of his life. His skills were sought by the Corporation for Public Broadcasting in the States and he also advised the Australian Broadcasting Commission. But for the BBC he made a number of broadcasts, often to recall his wartime experience but more importantly he persuaded the management to commit resources to an oral history project. The project sought to record the views and experiences of all the key players in the BBC's history, especially as many from the early years were starting to die off. These audio and visual testimonies have proved invaluable to historians and documentary makers alike and some will be made available online as part of the 100 Voices that Made the BBC - Radio Reinvented project. In 1997, as part of the BBC's 75th anniversary celebrations, David Dimbleby introduced an appreciation of Frank's career in Frank Gillard's BBC. This programme was heard on Radio 2 on 19 October 1997. Almost a year after this broadcast Frank Gillard passed away aged 89. 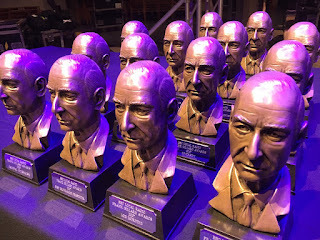 Two years later the BBC inaugurated the annual Gillard Awards for those working in local radio that would recognise the achievements and encourage excellence in programming. They are a fitting tribute to a man who did so much for local broadcasting. BBC Radio Merseyside was the third station in the local station network and marked a return to radio in Liverpool since the days on 6LV, the BBC relay station of the 1920s, though Liverpool retained a post-war presence at the Rylands Buildings on Lime Street (and later at Castle Chambers on Castle Street). BBC Radio Merseyside's first studios were based in Commerce House on Sir Thomas Street under the guidance of station manager Michael Hancock who'd previously been working as a BBC TV presentation editor in London. He was a local newspaper journalist who'd joined the BBC as a sub-editor and reporter on Sports Report. Moving across to television he was a news reporter before taking up the presentation editor post. After Radio Merseyside he was based at Pebble Mill as a regional TV manager and then Press and PR before finally joining JCB as a PR director. Michael died in 2007. Unlike other BBC local radio stations that relied on the work of the Radiophonic Workshop for the idents, Radio Merseyside commissioned Gerry Marsden to write the opening jingles sung by The Vernons Girls. Taking their cue from Gerry and the Pacemakers the opening day included an OB on a ferry across the Mersey; the ferry being the Royal Daffodil (originally the MV Overchurch). On board were presenters Tony Wolfe and Keith Macklin (best known as a rugby commentator for the BBC and then covering football for Yorkshire TV and later programme controller at Preston's Red Rose Radio). A number of acts from the city's Cavern Club also appeared on that opening show including club DJ Billy Butler who would, of course, become the voice of the station, first joining in 1971. 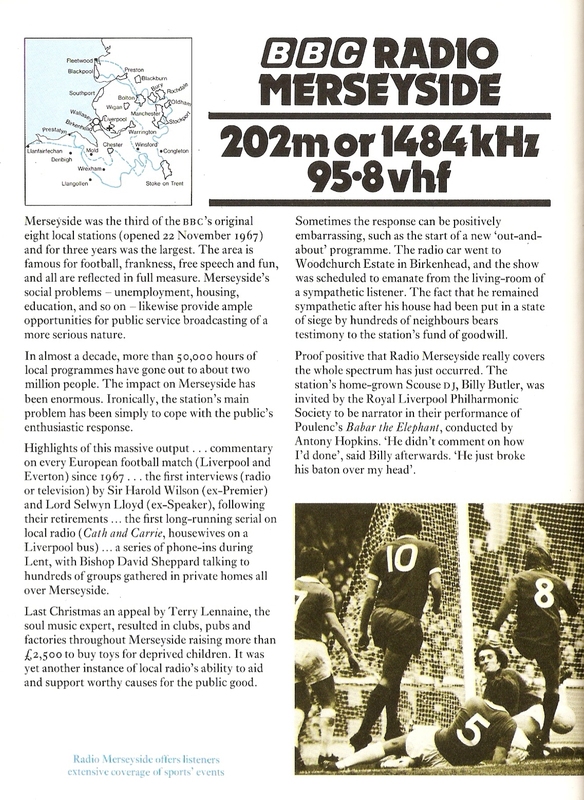 Launching at 12 noon on the 22nd Radio Merseyside's opening programme, linked by Ian Murray, had some ambitious OBs. 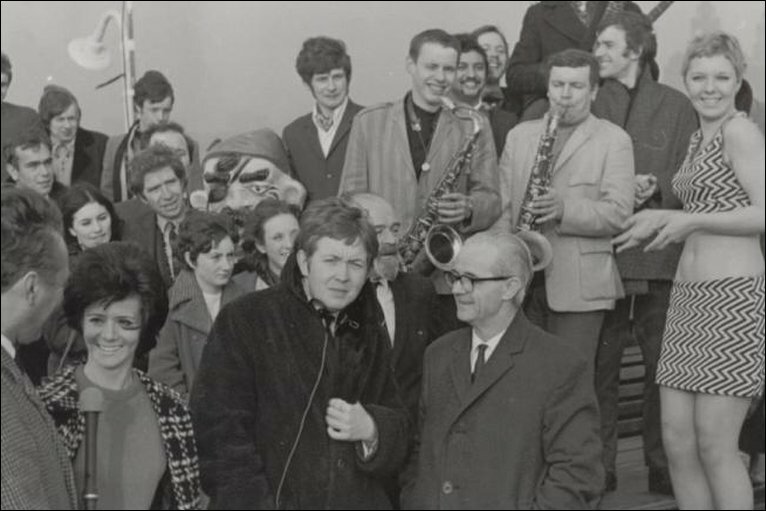 As well as the Mersey ferry there was Victor Marmion and Jenny Collins in the Mersey Tunnel and Gerry Harrison and Joyce Timewell at the top of St John's Beacon - a broadcast not without some technical difficulties. Former teacher Vic Marmion was the deputy manager and was instrumental in bringing Kenny Everett and Alan Bleasdale (writing Scully) to the station. He left in 1974 to work for radio current affairs in London, producing The World at One and PM before moving to BBC TV in 1978 and working on Tonight, Question Time, Panorama and The Money Programme. He left the BBC in 1988 to run an independent production company in Liverpool but was back at the Beeb in 1994 in the Programme Complaints Unit. Retiring to Hastings in 2004 he died in 2012. Jenny Collins would work for Radio Merseyside for many years and married Steve Voce (see below). Former footballer and Daily Express news reporter Gerry Harrison joined the station for its launch and would help with the sports coverage. A couple of years later he moved into full time football commentating for Anglia TV and remained with ITV until the early 1990s. For this series of posts I've been digging out copies of the Radio Times from the first decade of local radio broadcasting but the earlier editions are a bit light on information. However, the latest issue I could track down is from 7 March 1970 so if anyone is reading this in Merseyside and has some back issues lying around please let me know. At the time of this schedule the station manager was now Rex Bawden. A very experienced newsman, he'd joined the station in 1968 from the Liverpool Echo to become the news editor and then replaced Michael Hancock as manager until his retirement in 1981. He died in 2012. Typically at that time the station staff would pop up on more than one show. Ian Murray, for example, is listed on the Monday request show Date-a-Disc and Tuesday's Somebody in Particular, a show idea not a million miles away from Desert Islands Discs. 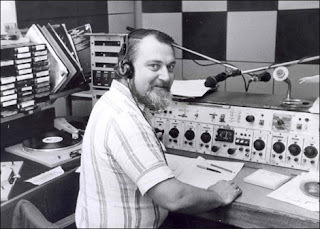 Later in the year Ian would join BBC Radio Manchester for the start of their service. Cropping up on a number of programmes, including the women's magazine Breaktime, is Jim Black. Liverpool-born Jim had joined the BBC as a studio manager in 1959, later working on SM duties for Woman's Hour. 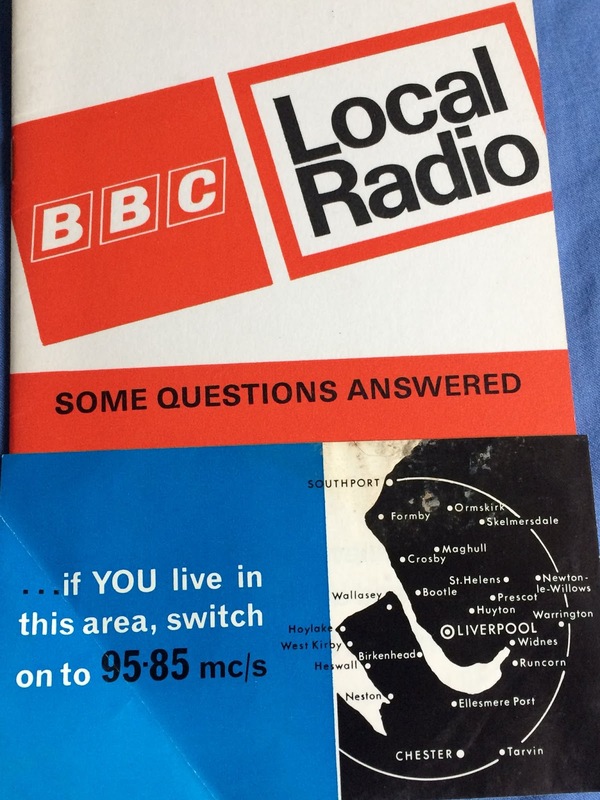 He took part in the local radio closed circuit experiments in the early 60s and when the service finally got the go ahead in 1967 he joined Radio Merseyside as a producer and presenter. In the early 70s he joined the Local Radio Training Unit based in the Langham. When presentation editors were appointed to each of the national networks in 1973 - Jimmy Kingsbury for Radios 1 & 2, Cormac Rigby for Radio 3 - it was Jim Black who was in charge of Radio 4, much to the surprise of some of the continuity announcers who'd applied for the post. Amongst his best known on-air changes was the introduction of Sailing By before the shipping forecast and to commission Fritz Spiegl, whom he'd worked with at Radio Merseyside, to arrange what would become known as the UK Theme. In the late 80s he was appointed as a Special Assistant to the managing director of network radio, David Hatch, and worked on a number of projects including the launch of Radio 5. He left the BBC in 1993 and died in 2008. 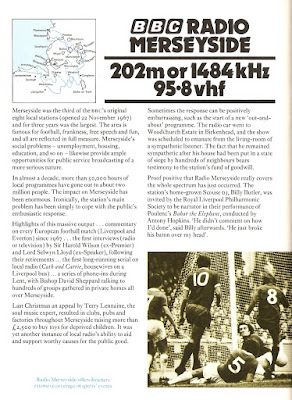 Radio Merseyside's longest-running programme (indeed the second longest running across all the local stations after Radio Leicester's Down to Earth) is Folkscene, initially billed as The Folk Scene. 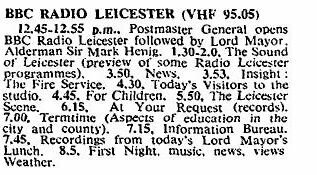 For 49 years the presenter was Stan Ambrose, listed here on Thursday evening. Stan sadly passed away last year. For most of the time he shared presenting duties with Geoff Speed, another broadcaster there from the start who only stepped down in 2014. 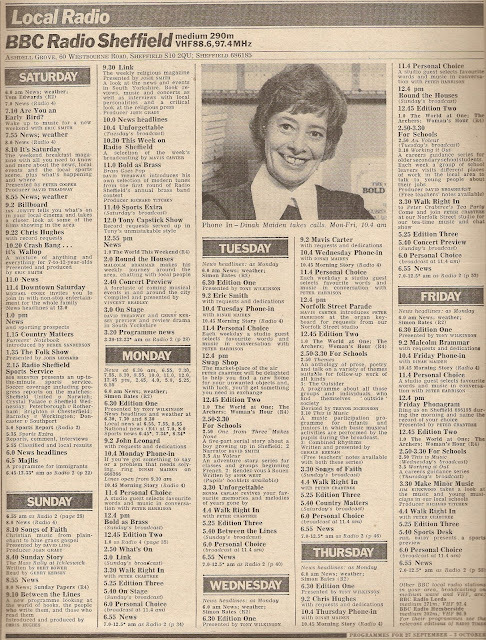 Presenter Mike Gamble, in 1970 listed against Youthwise on Sunday and Thursday's Homeward Bound would later become a TV announcer on BBC1 and BBC2. The Scouse Show with "songs and stories from Scouseland" was presented by writer Frank Shaw. Frank had been writing about Liverpool for the best part of two decades and, in 1966, had penned the Lern Yerself Scouse book (it was edited by Fritz Spiegl). He'd appeared on the BBC and ITV and provided the research for Denis Mitchell's acclaimed 1959 TV documentary about Liverpool life Morning in the Streets. He died in 1971. Another Frank, this time Frank Unwin, is listed as presenting Thirty Minutes of Music and Memories which ran for many years and even spawned a book Mersey Memories in 1986. All the local radio stations had specialist music shows and Merseyside's Jazz Panorama was hosted by jazz writer Steve Voce. He appeared on the station for 35 years and had previously provided new record reviews for The Jazz Scene on the BBC Light Programme. In the 70s and 80s Steve appeared on Sounds of Jazz on Radio 1, later on Radio 2 and Jazz Notes on Radio2 , later on Radio 3. Only one broadcaster could claim to have appeared on both 6LV and Radio Merseyside and that was naturalist Eric Hardy. Born in 1912 he'd been writing his Countryside column in the Liverpool Daily Post since 1929. During the war in North Africa he trained pigeons to fly with messages tied to their legs. He was a founding member of the Mersey Estuary Conservation Group and the Lancashire Wildlife Trust.. His Radio Merseyside programme The Countryside (billed in 1970 on the Thursday evening) ran for over three decades. Eric died in 2002. 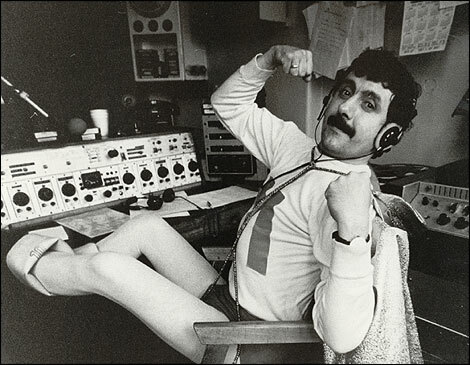 One of Radio Merseyside's best loved broadcasters was the larger than life character, Bob Azurdia (pictured above). Bob presented all manner of programmes but was particularly associated with the sports coverage. Born in Liverpool but of Guatemalan heritage he worked as a journalist on a number of local papers as well as writing for Melody Maker and Merseybeat, a job that brought him into contact with the Beatles at the start of their career. He was working for the Catholic Pictorial when he applied for a job at the new BBC station, landing the role of producer of religious programmes. As well as football commentaries he was a quiz master, presented daytime shows including breakfast, made documentaries and the The Azurdia Interview series. A keen long-distance runner and charity supporter he died unexpectedly in 1996 aged 60. 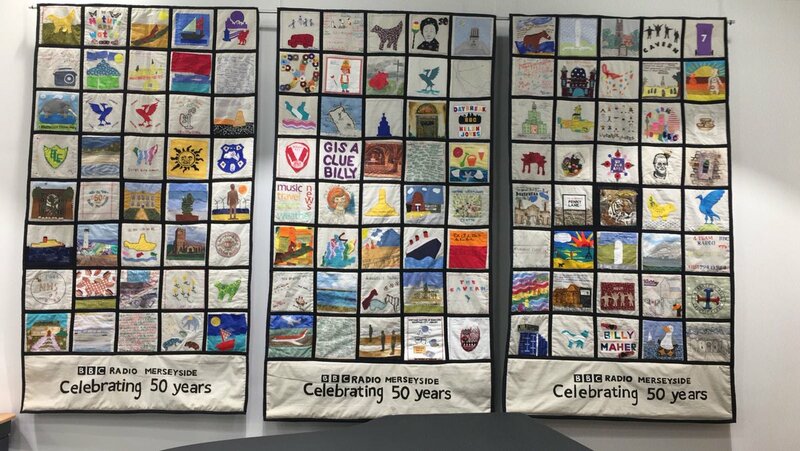 BBC Radio Merseyside is celebrating its 50th birthday today with broadcasts live from the Museum of Liverpool and a local choir will be signing some of those original Gerry Marsden jingles. 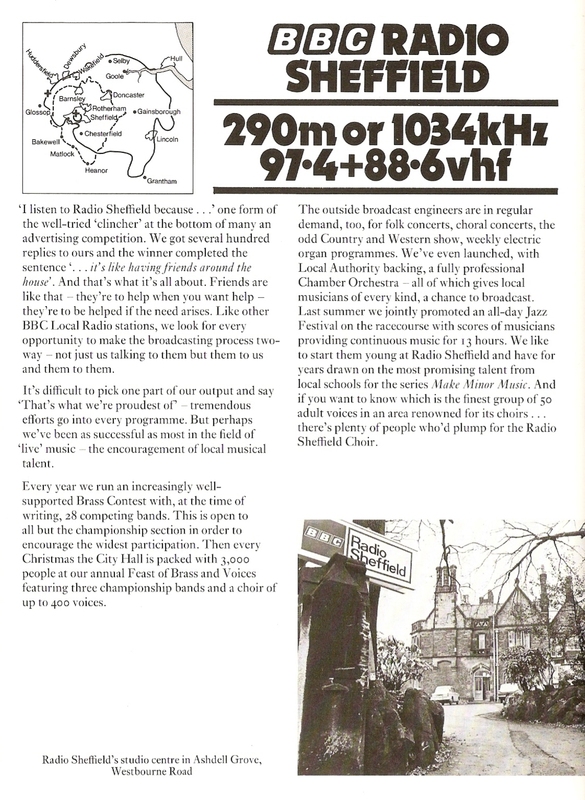 BBC Radio Sheffield was the second of the experimental local stations to open in 1967 just one day short of the anniversary some 44 years earlier of the opening of the Sheffield relay 6FL on 16 November 1923. The station's first manager was the former Home Service producer and presenter based in Manchester Michael Barton who'd played a part in the early 60s closed-circuit tests in Hull. His deputy was Tim Neale who would replace him as manager when he moved on in 1972. Michael went on to become the Controller, Local Radio. You can hear him talking about his career in this edition of Radio Moments:Conversations. The original line-up at Radio Sheffield included Geoff Sargieson (later in management roles at Radio Aire, BBC Radio Humberside and BBC Radio York), Jack Thompson, Michael Green (later taking a network production job in Manchester and then Controller of Radio 4), sports editor David Jones (later at Granada and Tyne Tees), Janie Griffiths (later children's programme director at ITV and Nickelodeon), Sheila Yeadon, Mary Redcliffe and Ted Gorton (later station manager at BBC Radio Oxford). In this short sequence you'll hear Jack Thompson opening the station with an ident using the sound of Sheffield cutlery created by David Cain of the BBC Radiophonic Workshop, a link-up with Radio 4's Today programme presented by Jack de Manio, Ted Gorton with listener Dorothy Revell and her son Derek, another radiophonic piece, this time a news theme composed by John Baker, Michael Cooke and finally Tony Capstick. 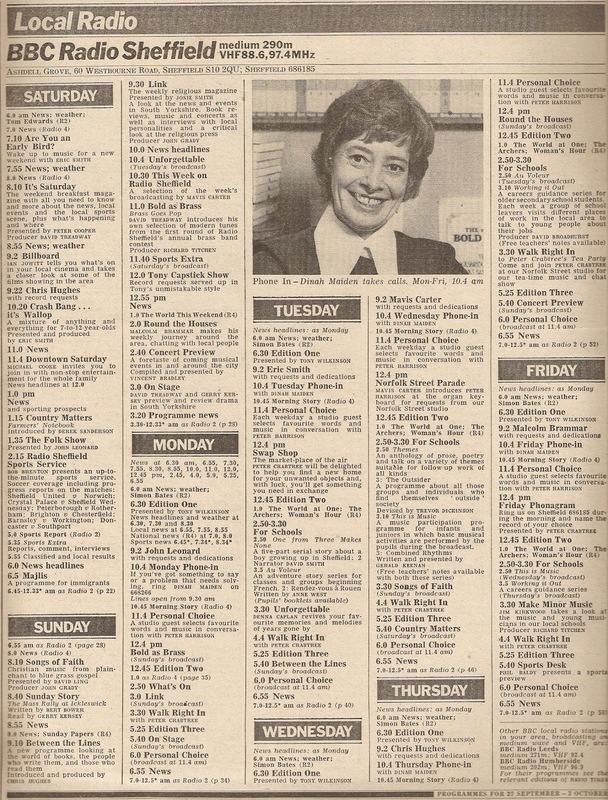 Here's the schedule from the Radio Times for the week commencing 27 September 1975. 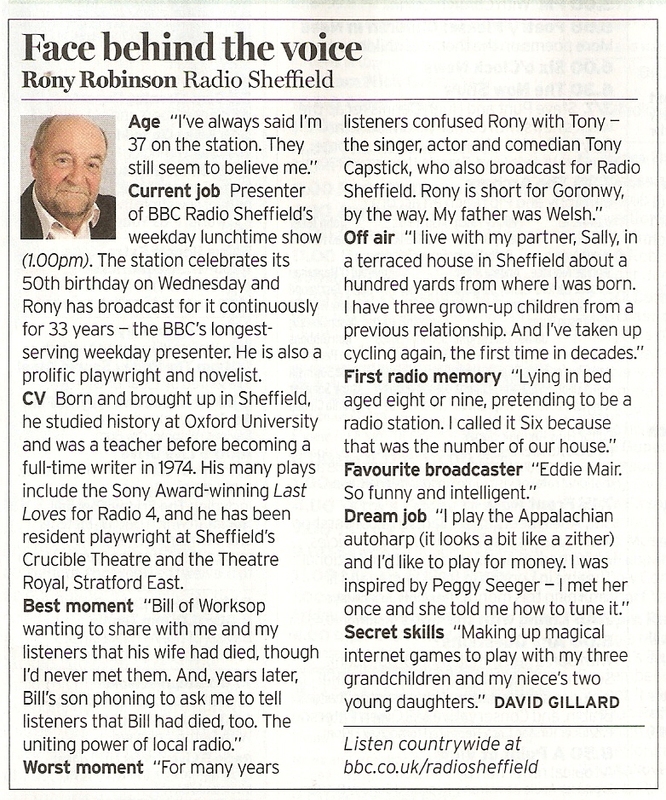 The listings are packed with names that will be very familiar to Radio Sheffield listeners in the 70s and 80s. 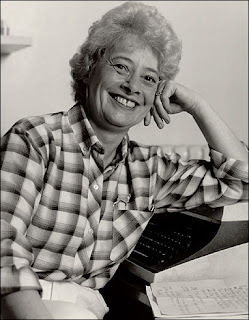 Dinah Maiden was Sheffield's phone-in queen. A station regular for 20 years Dinah (pictured below) had started out as a reporter and then sub-editor on local newspapers in the South Yorkshire area. She first appeared on the station in 1970 as a guest on a current affairs discussion and was subsequently asked to join the staff where she hosted the phone-in and then the breakfast show. Edition One was the name of the station's breakfast show from the launch. Edition Two and Edition Three being the lunchtime and teatime news round-ups. The programme had been presented by Ian Masters (later of BBC Radio Norfolk and BBC TV's Look East) and Peter Harrison who even wrote a 26-page book about his shows - has anyone got a copy? Peter was another former newspaper man who also worked as a reporter on BBC TV's North West Tonight and as a producer on BBC Radio Manchester. At Sheffield in 1975 he was presenting the daily Personal Choice. The presenter of Edition One in 1975 is listed as Tony Wilkinson. Does anyone know if this is the same Tony Wilkinson that was a reporter on Nationwide or the presenter of Radio 4's Wlko's Weekly and The Street? Looking after the 9 am requests and dedications were a number of presenters. On Monday it was John Leonard. Folk musician John had joined the station to present the folk show (see Saturday) He would also appear with Tony Capstick on Radio 2's Folkweave before leaving Sheffield and moving to network radio in Manchester in 1982 where he co-produced Janice Long's Radio 1 show and Stuart Hall's Radio 2 show alongside David Treadway (see below). In 1992 John left the BBC to form the independent production company Smooth Operations with Nick Barraclough. And speaking of folk singers that brings us to one of Radio Sheffield's best known voices, that of Tony Capstick (pictured above). His somewhat idiosyncratic style and self-deprecating Yorkshire humour endeared him to listeners for three decades. He'd first been heard on the station in 1969 with Capstick's Carve-Up and then, as listed here, a Sunday lunchtime request show. Later he added a Saturday show before moving to weekdays in 1978 where he stayed until a rather ignominious sacking in 2003, he died a few months later. Sheffield's afternoon show was Walk Right In. 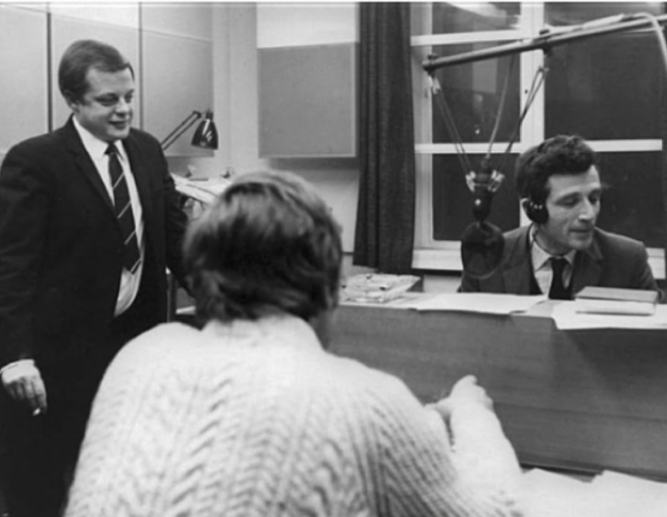 It had started in 1970 with Peter Crabtree and Ian Masters but by 1975 it was just Peter in the studio. 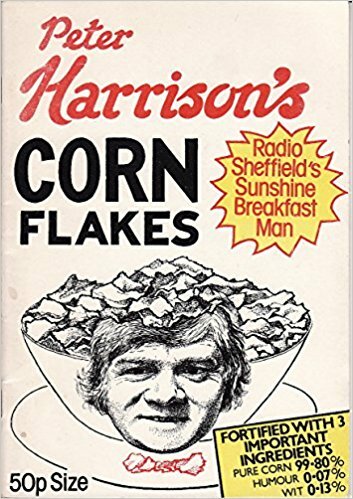 He'd started in local hospital radio doing sports commentaries and before becoming a sports reporter on Radio Sheffield and then joining full-time in 1969, staying for 20 years. One of local radio's longest-serving presenters pops up on Tuesday's request show and twice on Saturday with Are You an Early Bird? and the children's programme Crash Bang...it's Wallop. Eric Smith had initially joined the station, "after many unsuccessful applications to the BBC", in 1973 as the record librarian. He later gained a daily show and then moved over to Radio Stoke in 1978, did a spell on BBC TV in the north east, was back at Sheffield in 1980 before joining the launch team at Radio Aire in 1981. Eric briefly worked at Radios Humberside and Cumbria before moving to Shropshire in 1988 and for the last 20 years he's presented BBC Radio Shropshire's breakfast show - the last 6 years co-hosting with Clare Ashford. Michael Cooke was familiar to both TV and radio audiences in Yorkshire, appearing on Look North from Leeds alongside his radio appearances. He was a lecturer when he made his first broadcast on Radio Sheffield in 1968 and was subsequently invited to work for the station. In this schedule he presents Downtown Saturday but by 1978 he had a daily show on the station and remained on-air until the 1980s. On Radio 4 he also presented The World at One and PM Reports in 1973/4, Today 1976-8 and Sunday 1979-82. Listed as both presenter and producer is David Treadway. 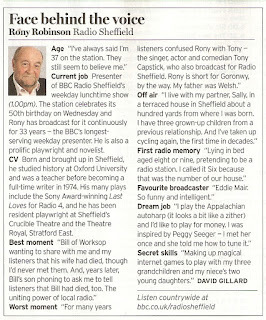 Initially freelance he joined the staff of Radio Sheffield in the early 70s. Moving to Glasgow in 1978 he worked as a producer for BBC Scotland and managed the BBC Scottish Radio Orchestra. In Manchester he worked for both Radios 1 and 2 co-producing with John Leonard. He became Radio 2's Assistant Controller in 1983 before leaving the BBC in 1990 to join United Artists Communications. More recently he has worked for 3i plc, WRN Broadcast and, in 2016, appointed as an MD at RR Media. Radio Sheffield is marking its 50th birthday with a couple of special programmes today. At 10 am Paulette Edwards and Rony Robinson broadcast live from the City Hall and then at 2 pm Steve White looks back the big momentsin the station's history. In the spring of 1954 Frank Gillard was on a fact-finding trip across the United States. What he witnessed would change the shape of British broadcasting. Gillard, at the time the Head of West Regional Programmes, was particularly impressed by station WVPO 'The Voice of Poconos' in Stroudsberg, Pennsylvania. 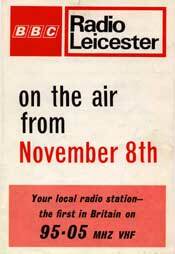 It "spoke to its listeners as a familiar friend and neighbour" and the whole operation was conducted with "the utmost informality"
The role of Frank Gillard as godfather of the BBC's local radio service leading to the launch of the first station, Radio Leicester, fifty years ago, is told today at 12 noon in Friendly Radio, a one hour programme to be broadcast on all the BBC's local stations. When the BBC had started radio broadcasts in the early 1920s it was on a local basis, aside from 2LO in London other stations launched in Birmingham, Manchester, Newcastle, Cardiff, Glasgow, Aberdeen, Bournemouth, Sheffield, Plymouth and Belfast. But by the end of the decade these and other relay stations had combined to form the Regional Programme, which continued after the Second World War as the model for the Home Service. Hidden in the Beveridge Report on Broadcasting (1949) was a hint of things to come: "Local broadcasting was abandoned in favour of regional broadcasting owing to a lack of wavelengths, and the increased supply of wavelengths promised by VHF or FM transmission makes it possible to revive it". However, it wasn't until the mid-50s that the Corporation seriously began to think about how it might further develop its radio services beyond the existing Home, Light and Third in the face of the advent of commercial television and the possible threat of commercial radio together with a decline in radio audiences in favour of the gogglebox. In 1955 Gillard (pictured above) was asked to chair the Sound Co-ordinating Committee. Whilst the Committee didn't specifically look at providing local radio a working paper drafted by Gillard, An Extension of Regional Broadcasting, did hint at the way things would go with a recognition of regional cultures, news-led services and making use of the VHF spectrum. Little happened on the matter within the BBC until 1960 when it was seeking a number of proposals to put before the Pilkington Committee on Broadcasting. It was Gillard that persuaded the management and governors to pursue the idea of local radio, with the support of incoming Director-General Hugh Carleton-Greene. Speaking in November 1960 Greene was already attempting to forestall any commercial radio competition: "we think the time has come for the extension of our existing regional and area services into local broadcasting ... we believe that the public service system would ensure for the local audience a more genuinely local independent programme than could be offered by any commercial arrangement." In 1961 and 1962 the BBC undertook sixteen closed-circuit experiments across the UK in order to test the water and to provide audio evidence to the Pilkington Committee. (For the experiences of 'Radio Norwich' see The Network That Never Was). It was believed that this so-called Fourth Service could, in the words of Director of Sound Broadcasting Lindsay Wellington "provide a friendly, companiable, reliable service which is closely in touch with the ordinary pre-occupations of people's lives, informs people about local affairs and discusses impartially the local questions which come close to home." Early proposals were bold in their ambition with six initial stations followed by a further eighteen by 1964 with each station costing £17,500 to build and £28,000 per annum to run "without seeking an increase in the licence fee". Pilkington accepted the BBC's proposals in principle but put them on ice - the Corporation would have to wait another four years. Meanwhile Frank Gillard, by 1963 now promoted to replace Wellington as Director of Sound Broadcasting, was setting out his vision for the new service (though perhaps understating the equipment required to get the stations on air). "The station needs a few tape recorders and a radio-equipped car which would soon become a familiar sight to every citizen". Listeners should "come to regard their local station as 'our station' not as 'the BBC station in our town'". In December 1966 the White Paper on Broadcasting gave a rather cautious go-ahead to local radio "by way of experiment" with a nine station project in VHF. Each station "would offer a full-scale local service ... and after a year or so of operation should have provided the information on which to found the final solution." The funding provision didn't wholly depend on the licence fee and would instead seek input from local councils (though not from the general rates), universities, Chambers of Trade, churches and local associations, businesses and the like. "Since the essential purpose of the local station is to give expression to local interests and aspirations, it seems right that its income should derive so far as is possible from local sources and not from a general licence fee". During the experimental period the BBC stumped up the capital costs averaging £35,000 per station whilst the running costs of about £1,000 a week were paid, for the most part, by community contributions. The support of local authorities and other interests was important because the new stations were seen not only as vehicles for educating and informing listeners but in directly involving them in extending democratic debate. Access programming was a key aspect of the new stations with volunteers helping to make some programmes and phone-ins soon becoming a staple of the schedule. Following the green light for the experiment the BBC wrote to every local authority seeking their input, over eighty responded and a conference was held at Broadcasting House jointly chaired by the Director-General and, on behalf of the Association of Municipal Corporations, Sir Mark Henig. Eight authorities agreed to proceed and it was then up to them to seek out groups and businesses that would stump up the cash. Thus the stations that would come on stream were to be Leicester, Sheffield, Liverpool, Nottingham, Brighton, Stoke, Leeds and Durham. (The ninth station area on the initial list was Manchester but it failed to proceed due t change in political control in the 1967 local elections and so had to wait for the second phase in 1970). Though each station manager would have a degree of autonomy as to what programmes went out, what specialist groups they addressed and what network programmes they selected to fill the gaps (in the early days they switched over to Radio 1, 2 and 4) the station's output was overseen by a Local Radio Council comprised of interested lay people appointed by the Postmaster-General, though lists of members in the 1969 BBC Year Book does seem to show a preponderance of Aldermen. 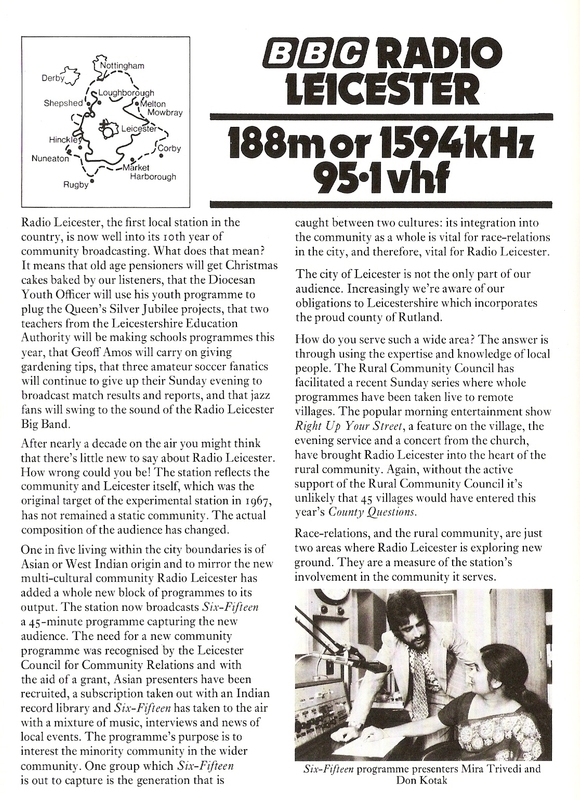 BBC Radio Leicester was the first of the new stations to launch on 8 November 1967 - initially on 95.05 VHF only, transmissions on medium wave didn't come along until 1972. Leicester Corporation -it's Mayor was the aforementioned Mark Henig - had been particularly enthusiastic and put together a financial package totalling some £104,000 towards the running costs. The "home town radio station" was opened at 12.45 pm by the Postmaster General, Edward Short, and an opening theme based on Post Horn Gallop. 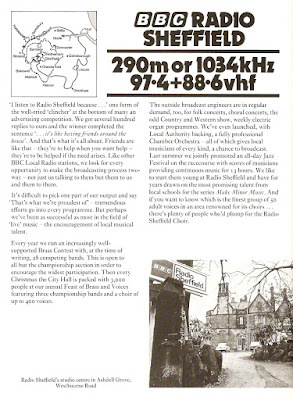 The initial tranche of stations had, according to the BBC, and number of conditions to meet: "Has the experiment shown that local radio benefits a community? Has it informed and entertained people about the town in which they live? Has it opened their eyes to the defects, achievements and aspirations of their city? The only way of getting 'yes' to these questions is to broadcast news and other programmes of such compelling interest that people cannot afford to miss them". In the event, and before the expiry of the test period, the Government allowed the BBC to extend the network to twenty stations and to fund the expansion from the licence fee. 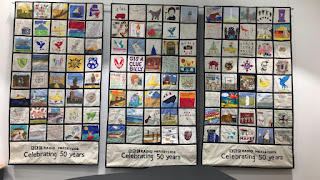 Reviewing the first two decades of local radio was this Radio 4 programme (which I have posted previously) presented by David Clayton and Neil Walker. The Switched-On Parish Pump includes contributions from Dennis McCarthy, Michael Barton, Allan Shaw, Jim Latham, Mick Wormald, Michael Buerk, Kate Adie, Tom Beesley and Billy Butler. Clips of those 1961/62 closed-circuit experiments are much in evidence in this edition of Radio 4's The Archive Hour from 2007. Libby Purves celebrates the 40th anniversary of local radio. and we hear the voices of John Snagge, Matthew Linfoot, Michael Barton, Michael Barrett, David Dimbleby, Lincoln Shaw, Ken Warburton, John Gillmore, Roger McGough, Rex Conway and Herdle White. In 2007 the BBC Four documentary strand Nation on Film looked at the early days of BBC local radio .One of themes that comes out in this programme is how little the BBC in London paid heed to what the local stations were doing. Most of the media attention seemed to come from the ITV news programmes, probably because they had half an eye on getting involved in local commercial radio. There are contributions from Des Lynam, Kate Adie, Michael Barton, Gillian Reynolds, Mike Hollingsworth, Tom Beesley, David Blunkett, Tony Cook and Gerald Jackson. Friendly Radio can be heard on all BBC local radio stations today at 12 noon - some times vary if the station has sports coverage - and is narrated by David Lloyd and produced by Trevor Dann. 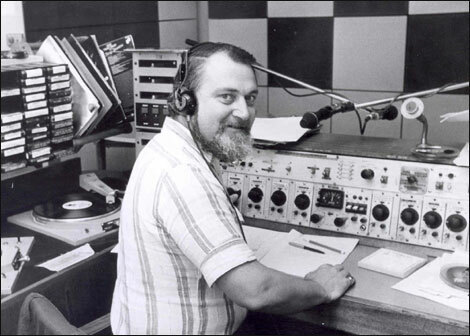 You can hear Frank Gillard in conversation with Helen Fry talking about the lead-up to the launch of local radio in this recording made for the BBC's Oral History project in 1976. Coming up this month a dip into the archives with blog posts on Radio Leicester, Radio Sheffield and Radio Merseyside plus the life and career of Frank Gillard.